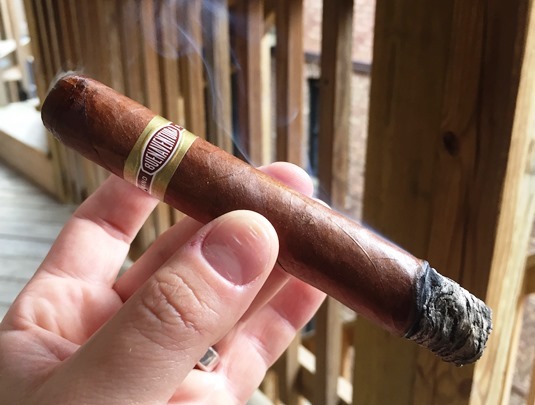 Cigars in the Buenaventura line from Curivari have gotten multiple high marks from StogieGuys.com, including the BV 550 (pictured). This big stick—a lightly box-pressed gordo (6 x 60) Nicaraguan puro—is another one well worth checking out. It’s a bargain smoke. I paid a little over $6 for a single, and you’ll find them online for close to $5 each by the box of ten. It is medium in strength with a smooth combination of a little spice, a little cedar, and a little pepper. I’d say the BV 600 is an ideal candidate for that second cigar to get you through the final half of a football game.